If you are still not sure if any of the programs Clarissa is offering would assist you, book a complimentary phone call with Clarissa here to discuss your needs. Hi! My name is Clarissa Rayward, I am the Director of Brisbane Family Law Centre and I am now a ‘mostly’ happy lawyer- but it wasn’t always this way. A few years ago I found myself ready to throw in the law towel as I was a deeply unhappy lawyer. I was not waking up and bouncing out of bed to get to the office; I was actively looking for reasons not to have to be there. I was finding myself struggling to do things in my job that I had been doing for years – even the simple stuff was becoming tedious and hard. I was spending most of my time worrying, and most of that worry was focused not on what I felt or thought but on what others would think, feel or say about me. I was, in turn, distracted in my marriage, feeling disconnected from my daughter and finding my friendships becoming harder to enjoy. I describe this as me feeling ‘unhappy’. Rather than throwing in that law towel I made a decision to change my approach to my life in law. Over the next 2 years I actively made changes that have resulted in me finding a way to stay in this career and largely be ‘happy’ again. As I began to write, talk and share my own challenges with unhappiness I started to hear from many other lawyers, just like you, who were also looking for new and better ways to stay in the law, be great lawyers and manage to lead a great life all at the same time. I soon realised I was not alone and I wanted to do something to ensure that the many great lawyers around me were not also finding themselves deeply unhappy and leaving the law. 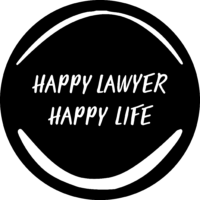 So with some help from a few friends I launched a podcast- Happy Lawyer Happy Life- where each week I interview fellow lawyers to open a dialogue on just what it has taken for them to find happiness in this challenging career. I have also written a book by the same name- sharing my research and learnings on happiness as a lawyer. Then a few lawyers asked me if I could ‘teach’ them what I did and voila- after a trial run with some friends, I created this course designed to help you better manage your law career and find happiness along the way. I am a lawyer who is just like you- I have worked hard to get where I am and want to ensure that I can stay in this profession for many years to come but have a great life with my family and friends along the way. Chances are if you are reading this you are feeling some (or all!) of what I felt a few years ago. If so come and join “The Club” or participate in the next round of the 8 week Course, as I take you through the tools you will need to become a Happier Lawyer.